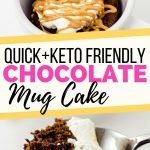 This double chocolate keto mug cake recipe is the fastest, easiest way to satisfy any chocolate craving on a low carb diet! Did you know there’s a big debate in the mug cake world? Are you ready for it? Who knew it was such a hot topic? Certainly not me, but it kept coming up over and over again while I was researching and developing this recipe. And I completely get both sides of the argument. It’s true that a full-size cake only uses a few eggs, but on the other hand, coconut flour usually needs a little extra help in the structure department. So I tested several different versions of my recipe before I settled on this one, and I went with the egg. Both recipes I came up with were delicious, but the version without egg was more like a brownie while the version with the egg is truly a cake. I added chocolate chips because I don’t know about you, but when I’m looking for a quick chocolate fix my preference is double chocolate all the way. Is Chocolate Allowed In The Keto Diet? This recipe uses chocolate chips. But is chocolate allowed as part of the keto diet? Really good dark chocolate is made from 2 ingredients: Cocoa nibs (what is left of the bean after the husk is removed) and sugar. Sometimes additional cocoa butter will be added to make the chocolate easier to work with, and some chocolate makers use a tiny amount of an emulsifier like soy lecithin. So we know that the carbs in dark chocolate are coming from the nibs and sugar. Cocoa nibs have about 3 grams of carbs per tablespoon with over half coming from fiber, making the cocoa nibs themselves pretty keto friendly. Note that cocoa powder is just ground up cocoa nibs with most of the fat (cocoa butter) removed, so it also works well in low carb baked goods. But what about the sugar in dark chocolate? Good dark chocolate made with sugar may look pretty low carb friendly, but as a Type 1 Diabetic, I find that it requires a lot more insulin than the nutrition label would suggest. Instead, I try to stick to chocolate sweetened with allulose, stevia, erythritol, or inulin whenever possible. Watch out for sweeteners like Maltitol and Sorbitol, which are often used in sugar-free candy but aren’t actually keto friendly (and can also cause tummy trouble). I use Lily’s Sugar-Free Chocolate Chips and KNOW Foods chocolate chips. Pascha Organic 100% Cacao Unsweetened Chocolate Chips are another great option. If you are buying dark chocolate made with sugar, look for the highest percentage of cocoa solids possible (definitely over 75%), and stick to one half of a serving at a time or less. Endangered Species’ Strong + Velvety 88% Dark Chocolate Bar is just one example. Making keto mug cake is SO, SO easy and quick. This recipe will satisfy that chocolate craving in less than five minutes, so you can put that sugar-filled pint of ice cream right back in the freezer! Now that’s how you stick to your low carb diet! All you will need to do is combine the dry ingredients in a mug, and then mix in the wet ingredients and the chocolate chips. Feel free to mix it up with a fork, no need to use anything fancy! 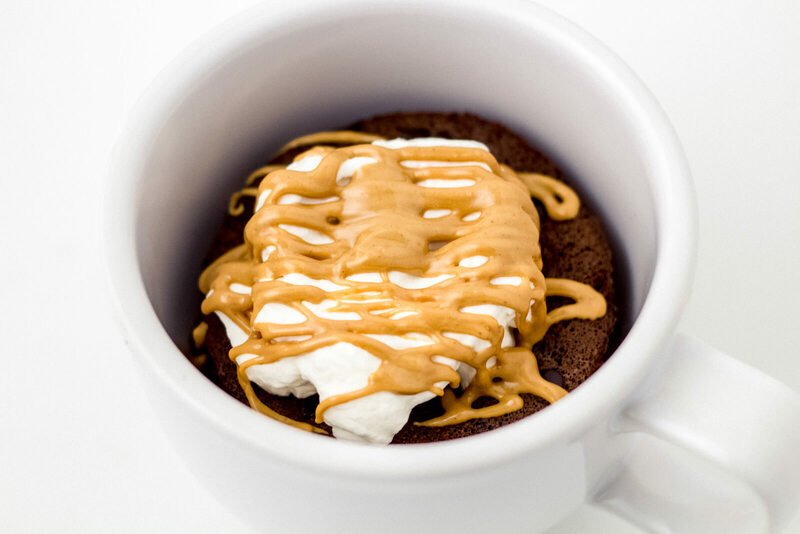 Next just microwave your mug cake for approximately 90 seconds and voila – chocolate keto mug cake! I like to top mine with whipped cream and a drizzle of unsweetened peanut butter. Is Coconut Flour Keto Friendly? At first glance, coconut flour is kinda confusing. I mean, one cup of Bob’s Red Mill Organic Coconut Flour has around 72 carbs, vs all purpose flour’s 95 carbs per cup. So why is coconut flour keto friendly? Well, the total carbs per cup only tell part of the story. First, coconut flour is extremely absorbent, so you need wayyy less. It’s common to see recipes using ¼ to ⅓ the amount of coconut flour compared to the amount of all-purpose flour that would be required to absorb the same amount of liquid. Second, over 50% of coconut flour’s carbs come from fiber, while less than 4% of all purpose flour’s carbs do. And while I don’t often advocate counting net carbs, all that fiber definitely changes the way my body reacts as a Type 1 Diabetic. If one cookie recipe calls for two cups of all-purpose flour, that flour adds 190g carbs and 7g fiber to the full recipe. That same recipe would only need around 1/2 cup of coconut flour, which adds 36g carbs and 20g fiber to the total. And while converting a standard recipe to a coconut flour recipe usually requires a lot more finagling of ingredients (shortbread crusts, ahem!) this is an easy way to understand why coconut flour is so keto friendly. Combine the coconut flour, cocoa powder, allulose, baking powder, Salt and Cinnamon in a 12 oz mug and mix with a fork or small whisk to break up any clumps. Add the half and half, egg, and vanilla to the dry ingredients and mix to combine, making sure no dry ingredients are hiding at the bottom. Sprinkle the chocolate chips evenly over the cake batter (if you mix them in they tend to sink to the bottom). Microwave for 90 seconds. If your microwave is under 1000 watts, you may need to cook it longer. No microwave? Mix the cake in an oven-safe dish like a ramekin and bake at 350 degrees F for approximately 15 minutes. WANT TO SAVE THIS RECIPE FOR LATER? 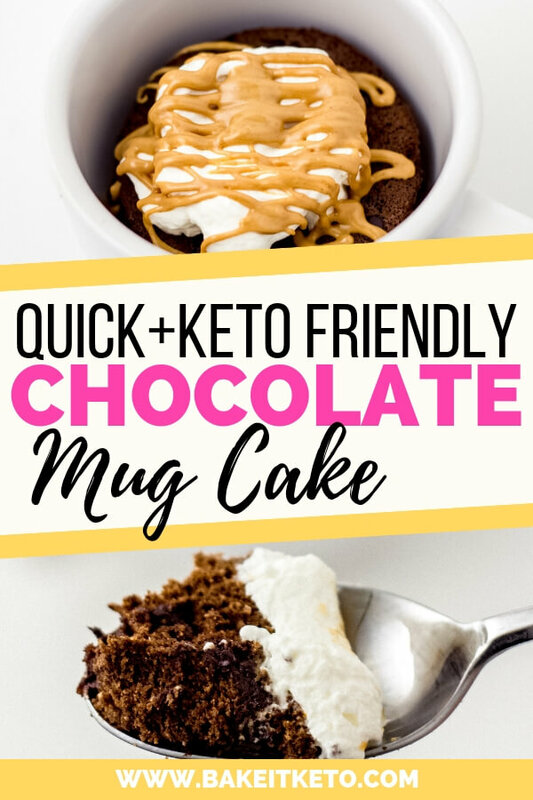 CLICK HERE TO PIN THIS QUICK AND EASY KETO CHOCOLATE MUG CAKE TO YOUR FAVORITE KETO PINTEREST BOARD!